St. Joe's Prep will be playing with the big boys next season. There is name recognition, with the son of a Hall of Famer, Marvin Harrison Jr., the other, the son of a former beloved Eagle, Jeremiah Trotter Jr., and a national-level quarterback who is getting major Division I attention as a sophomore, 6-foot-3, 200-pound Kyle McCord, who was the Philadelphia Catholic League MVP and who threw for over 280 in the PIAA Class 6A state championship. Put all of that talent together and it spells one of the top five high school football teams in the nation next season for St. Joseph’s Prep, the defending PIAA Class 6A state champions. That talent will be tested this season with perhaps the toughest schedule in the country when the Hawks face Marietta High School (GA), on August 30, Washington D.C. stalwart St. John’s at Rutgers University on September 6, and conclude their non-league schedule by hosting national powerhouse IMG Academy Friday, September 13. The Hawks, who finished 2018 at 13-0, will begin the 2019 season as one of the top five high school teams in the nation. They’re undergoing a slight transition from Gabe Infante, who left after nine season to become the running backs coach at Temple, to Tim Roken, who served under Infante as associate head coach and offensive coordinator for nine years. While at Prep, Infante would play the Philadelphia Eagles if he could. Roken certainly isn’t backing away from that mentality with the loaded schedule the Hawks are playing this coming season. The Hawks finished last year ranked No. 6 in the country by USA Today and No. 11 by MaxPreps. There is a good likelihood that St. Joe’s Prep will be on national TV against IMG Academy. “We’ve always had an aggressive mentality in scheduling non-league games,” Roken said. “Iron sharpens iron, right? So when you’re playing against great opponents, you know you’re going to find out a lot about yourselves and it only makes you better throughout the year. We’re grateful for the opportunity to play against such high-level opponents like Marietta, St. John’s and IMG. 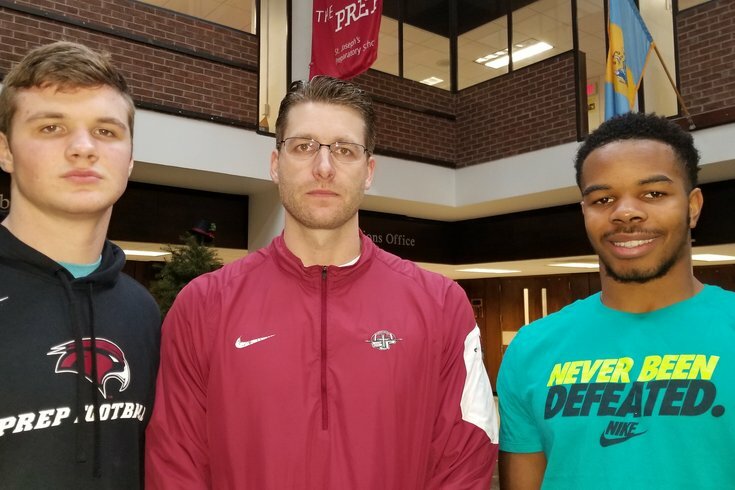 “I’ve had the firsthand experience over the last nine years of scheduling tough non-league opponents help you for your league and later down the line, taking the road to Hershey (for the state title). The big games are very exciting. It is a big deal for the national attention? It’s always been the vision of the program to be the top team in the country, doing everything to the best of our ability. In the state championship game, when the Hawks beat Harrisburg, 40-20, McCord completed 26 of 37 passes for 284 yards and two TDs. Harrison finished with a team-high eight catches for 76 yards, and Trotter was arguably the best player on the field. With an NFL Films camera crew covering his every step, “The Hatchet” played the best game of his young life on the biggest stage, leading the Hawks with 12 tackles, two solo tackles for nine yards in losses, while Hawks’ junior Anthony Rightley yanked in three interceptions in leading the Hawks to their fourth state title in six years. The Hawks will open against the Marietta Blue Devils, a historically outstanding program that in 2017 reached the state quarterfinals and had one of the toughest schedules in the country last year. The second game will be at Rutgers University’s HighPoint.com Stadium against St. John’s College High School, which finished last season 9-1 and ranked second in the region. The team was ranked in the top five in the nation before being upset in the league championship last year. The last of the three games will be against renowned IMG Academy. Playing a national schedule, IMG finished 7-1 last season and ranked second in the country, according to MaxPreps. The squad had a 40-game win streak, dating back to 2014, snapped in a loss last year to Mater Dei (CA), the eventual mythical national champions, according to USA Today.